There are many places to shop in Vancouver, but some of the best places, especially when the weather encourages you to stay inside, are the great Vancouver malls. We’ve listed the four biggest and best here. Pacific Centre might be Vancouver’s most popular mall. It is right downtown at the corner of Georgia and Howe Street It’s more than 140 stores include Holt Renfrew, Harry Rosen Men’s Wear, The Gap, Banana Republic, Ermenegildo Zegna, Esprit, and La Jolie Madame Lingerie. It attracts more than 400,000 visitors weekly. Parking is located directly under the Centre. 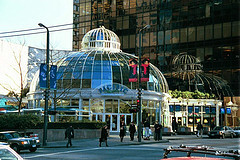 This 150 shop mall is full of light and excellent designer shops, including Kookai, the very ‘in’ French knitwear, Birks, with its selection of Canadian diamonds, Blue Ruby Jewellery featuring many local designers, Vincenta baby wear, Boys’Co men’s clothing, and popular Vancouver stalwarts including The Bay, a Canadian institution, and Zellers where you’ll find inexpensive, fashionable clothing and accessories. Located in Burnaby, this Mega-Mall is easily accessible by SkyTrain. Just hop on the SkyTrain and get off at the Metrotown Station where you’ll find three adjoining malls: Station Square, Metrotown Centre, and Eaton Square. Park Royal has the distinction of being Canada’s first mall. It is located just west of the Lions Gate Bridge in West Vancouver at the corner of Taylor Way and Marine Drive. Park Royal’s more than 250 shops and services include A Wear, a popular Vancouver fashion label, Le Chateau, popular with teens, Roots, Aveda, Aritzia, a very popular women’s boutique, and several sporting goods stores. To get to Park Royal, cross the Lions Gate Bridge. When you exit the bridge, go west to the first intersection, and you’re there. From Horseshoe Bay, go south at the Taylor Way exit to Marine Drive. Park Royal is on your right in two buildings one on either side of Marine Drive at the corner of Taylor Way.